Canine Companions for Independence has placed the Lone Star State’s first facility dog trained specifically for a community of adults with special needs. 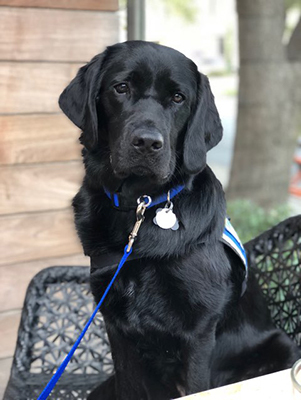 The non-profit organization’s South Central Region trained and placed a Labrador/Golden Retriever cross named Yoshi with Daymark Living, the DFW area’s first neighborhood for adults with intellectual and developmental disabilities (IDD). Opening this summer, Daymark Living provides a state-of-the-art residential community dedicated to helping adults age 18+ with IDD live, learn and thrive, in an all-inclusive environment that includes housing, education, and connections to employment. Daymark Living notes Yoshi’s presence has already helped future residents feel welcomed during the interview process, and been a benefit to its Social Club, which hosts at least two social events each month throughout the DFW area for individuals aged 15 and up. That said, her main mission will be to assist residents – helping to encourage each to achieve their personal best upon Daymark’s opening this summer. Summer Camp sessions begin July 9 while the full, in-residence experience is also on track to open in late summer. Both programs are currently accepting applications. Yoshi will be a constant presence in the clubhouse, there to interact with everyone that comes through the heart of Daymark Living. She will also be there to work with the residents if they have difficult day or need encouragement to participate in classes or activities. Already, a favorite command of future residents is Yoshi’s ability to rest her head on their lap with the “visit” command. Daymark Living features space for up to 202 residents in 28 luxury cottages, where each individual has a private bed and bathroom, as well as a complete meal plan, on-site medical attention and added security measures. A full array of indoor/outdoor resort-style amenities are set on 40 acres in Waxahachie, just 30 minutes south of downtown Dallas. It’s located in an area where adults with IDD face a lack of adequate independent housing options. Presently, just 400 quality beds exist in Texas to service roughly 574,000 adults with IDD in the three major markets (Dallas, Houston and Austin/San Antonio), according to a Texas Workforce Investment Council report - less than one percent of the identified population. To see Yoshi on Instagram (#_yoshigram_), click here. Canine Companions for Independence provides highly-trained assistance dogs to children, adults and veterans with disabilities at no charge. Established in 1975, Canine Companions has six training centers across the country. The largest non-profit provider of assistance dogs, Canine Companions is recognized worldwide for the excellence of its dogs, and the quality and longevity of the matches it makes between dogs and people. For more information, visit cci.org or call 1-800-572-BARK. Daymark Living is a community that was conceived, designed and built for people with intellectual and developmental disabilities (IDD). It provides housing, recreational, learning and employment opportunities in a 40-acre community in Waxahachie, Texas, just 30 minutes south of downtown Dallas. Currently under construction and slated to open later this summer, 28 resort-style cottages with 202 beds are designed to facilitate friendships and foster independence in a supportive, safe and supervised environment. Please visit http://www.daymarkliving.com or call 972-646-2162 for more information. For more information about Daymark Summer Semester, please visit: https://daymarkliving.com/summersemester/.